Wow *swoon* :love: Thank you so much for posting! I had a look and it says "Not Authorized". I guess you need a special member status to see those. All the pictures are the same on all agencies and dates "26.04.2011"
Thank you for finding and posting those great photos, Funky. RONAN Keating says his acting debut in Goddess, a kitchen sink musical currently shooting on the outskirts of Sydney, is the culmination of a decade's worth of hard work. "I've been doing castings for years," said the Irish singer on set in Bringelly this week, revealing he had screen tested for Moulin Rouge, King Arthur and The Hobbit. "My plan was not to do a movie that had music in it. [Goddess] just came my way and I think it's the perfect transition for me. It's almost like a stepping stone -- a great way to cross over. "And I love to sing. The funny thing is, I only have one and a half songs in this film." Most of the musical responsibilities on Goddess are shouldered by Keating's leading lady Laura Michelle Kelly, who has taken a four-month sabbatical from the Broadway production of Mary Poppins to play a recent British immigrant stuck in an isolated farmhouse in Tasmania with two unruly toddlers while her husband (Keating) is off saving the world's whales. Thanks for the pics. Only one and half song??? He said that in an interview a while ago. He is only the co-star in the movie, its Laura who is the lead charater of the film. What would Yvonne say? 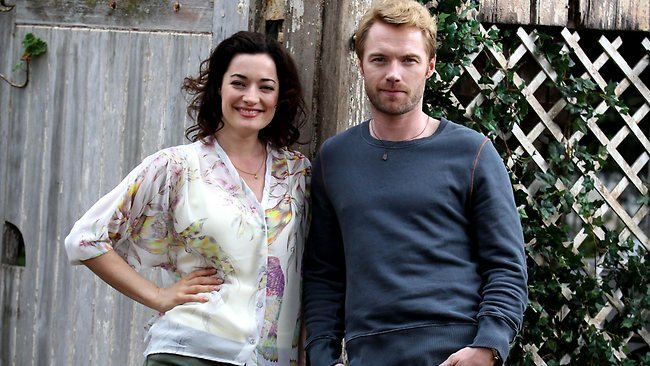 Ronan Keating caught with brunette in his arms… on set of his new film. As the brunette woman runs into Ronan Keating’s arms, wrapping her legs around his torso, you could be forgiven for thinking that he was greeting his wife after time spent apart – but Yvonne is a blonde. These pictures show the father-of-three sharing a heartfelt embrace with another woman – but it was just his co-star on the set of her new film. Ronan, 34, was pictured in Sydney filming scenes from Goddess where he plays the lead role, a marine biologist. The Boyzone singer was putting his acting skills to the test alongside Laura Michelle Kelly,29, who plays his on-screen wife. In the scenes for the film taken at the end of April Ronan and Laura are seen acting out a touching scene where they share a tender embrace and the Irish singer was also snapped touching Laura’s face and kissing her head. In an interview with the Daily Mail Ronan talked about why he decided now was the right time to start acting now. He said:‘ I wasn’t right before. I didn’t have the confidence in myself as an actor. I think the key to acting is knowing who you are as a person, and that’s where I feel I am now. He also revealed that he was ‘bloody terrified’ ahead of filming but form these pictures it appears he already has the knack of it. The pictures come almost a year after news broke that Ronan had been cheating on his wife Yvonne with a 27-year-old dancer. But the pair have put the affair behind them and following a brief split are now back on track.